For Australian rugby league footballer, see Josh Reynolds. 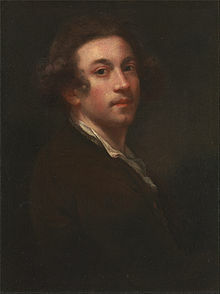 For the American football player, see Joshua Reynolds (American football). Sir Joshua Reynolds PRA FRS FRSA (16 July 1723 – 23 February 1792) was an English painter, specialising in portraits. John Russell said he was one of the major European painters of the 18th century. He promoted the "Grand Style" in painting which depended on idealization of the imperfect. He was a founder and first president of the Royal Academy of Arts, and was knighted by George III in 1769. Reynolds was born in Plympton, Devon, on 16 July 1723 the third son of the Rev. Samuel Reynolds, master of the Plympton Free Grammar School in the town. His father had been a fellow of Balliol College, Oxford, but did not send any of his sons to the university. One of his sisters was Mary Palmer (1716–1794), seven years his senior, author of Devonshire Dialogue, whose fondness for drawing is said to have had much influence on him when a boy. In 1740 she provided £60, half of the premium paid to Thomas Hudson the portrait-painter, for Joshua's pupilage, and nine years later advanced money for his expenses in Italy. His other siblings included Frances Reynolds and Elizabeth Johnson. As a boy, he came under the influence of Zachariah Mudge, whose Platonistic philosophy stayed with him all his life. Reynolds made extracts in his commonplace book from Theophrastus, Plutarch, Seneca, Marcus Antonius, Ovid, William Shakespeare, John Milton, Alexander Pope, John Dryden, Joseph Addison, Richard Steele, Aphra Behn, and passages on art theory by Leonardo da Vinci, Charles Alphonse Du Fresnoy, and André Félibien. The work that came to have the most influential impact on Reynolds was Jonathan Richardson's An Essay on the Theory of Painting (1715). Reynolds' annotated copy was lost for nearly two hundred years until it appeared in a Cambridge bookshop, inscribed with the signature ‘J. Reynolds Pictor’, and is now in the collection of the Royal Academy of Arts, London. Having shown an early interest in art, Reynolds was apprenticed in 1740 to the fashionable London portrait painter Thomas Hudson, who had been born in Devon. Hudson had a collection of Old Master drawings, including some by Guercino, of which Reynolds made copies. Although apprenticed to Hudson for four years, Reynolds remained with him only until summer 1743. Having left Hudson, Reynolds worked for some time as a portrait-painter in Plymouth Dock (now Devonport). He returned to London before the end of 1744, but following his father's death in late 1745 he shared a house in Plymouth Dock with his sisters. In 1749, Reynolds met Commodore Augustus Keppel, who invited him to join HMS Centurion, of which he had command, on a voyage to the Mediterranean. While with the ship he visited Lisbon, Cadiz, Algiers, and Minorca. From Minorca he travelled to Livorno in Italy, and then to Rome, where he spent two years, studying the Old Masters and acquiring a taste for the "Grand Style". Lord Edgcumbe, who had known Reynolds as a boy and introduced him to Keppel, suggested he should study with Pompeo Batoni, the leading painter in Rome, but Reynolds replied that he had nothing to learn from him. While in Rome he suffered a severe cold, which left him partially deaf, and, as a result, he began to carry a small ear trumpet with which he is often pictured. Reynolds travelled homeward overland via Florence, Bologna, Venice, and Paris. He was accompanied by Giuseppe Marchi, then aged about 17. Apart from a brief interlude in 1770, Marchi remained in Reynolds' employment as a studio assistant for the rest of the artist's career. Following his arrival in England in October 1752, Reynolds spent three months in Devon, before establishing himself in London, where he remained for the rest of his life. He took rooms in St Martin's Lane, before moving to Great Newport Street, his sister Frances acted as his housekeeper. He achieved success rapidly, and was extremely prolific. Lord Edgecumbe recommended the Duke of Devonshire and Duke of Grafton to sit for him, and other peers followed, including the Duke of Cumberland, third son of George II, in whose portrait, according to Nicholas Penny "bulk is brilliantly converted into power". In 1760 Reynolds moved into a large house, with space to show his works and accommodate his assistants, on the west side of Leicester Fields (now Leicester Square). The clothing of Reynolds' sitters was usually painted by either one of his pupils, his studio assistant Giuseppe Marchi, or the specialist drapery painter Peter Toms. James Northcote, his pupil, wrote of this arrangement that "the imitation of particular stuffs is not the work of genius, but is to be acquired easily by practice, and this was what his pupils could do by care and time more than he himself chose to bestow; but his own slight and masterly work was still the best." Lay figures were used to model the clothes. Reynolds often adapted the poses of his subjects from the works of earlier artists, a practice mocked by Nathaniel Hone in a painting called The Conjuror submitted to the Royal Academy exhibition of 1775, and now in the collection of the National Gallery of Ireland. 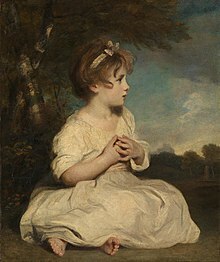 It shows a figure representing, though not resembling, Reynolds, seated in front of a cascade of prints from which Reynolds had borrowed with varying degrees of subtlety. Although not known principally for his landscapes, Reynolds did paint in this genre. He had an excellent vantage from his house, Wick House, on Richmond Hill, and painted the view in about 1780. Reynolds worked long hours in his studio, rarely taking a holiday. He was gregarious and keenly intellectual, with many friends from London's intelligentsia, numbered amongst whom were Dr Samuel Johnson, Oliver Goldsmith, Edmund Burke, Giuseppe Baretti, Henry Thrale, David Garrick, and artist Angelica Kauffman. Johnson said in 1778: "Reynolds is too much under [Charles James] Fox and Burke at present. He is under the Fox star and the Irish constellation [meaning Burke]. He is always under some planet". Because of his popularity as a portrait painter, Reynolds enjoyed constant interaction with the wealthy and famous men and women of the day, and it was he who brought together the figures of "The" Club. It was founded in 1764 and met in a suite of rooms on the first floor of the Turks Head at 9 Gerrard Street, now marked by a plaque. Original members included Burke, Bennet Langton, Topham Beauclerk, Goldsmith, Anthony Chamier, Thomas Hawkins, and Nugent, to be joined by Garrick, Boswell, and Sheridan. In ten years the membership had risen to 35. The Club met every Monday evening for supper and conversation and continued into the early hours of Tuesday morning. In later years, it met fortnightly during Parliamentary sessions. When in 1783 the landlord of the Turks Head died and the property was sold, The Club moved to Sackville Street. Reynolds was one of the earliest members of the Royal Society of Arts, helped found the Society of Artists of Great Britain, and in 1768 became the first president of the Royal Academy of Arts, a position he was to hold until his death. In 1769, he was knighted by George III, only the second artist to be so honored. His Discourses, a series of lectures delivered at the Academy between 1769 and 1790, are remembered for their sensitivity and perception. In one lecture he expressed the opinion that "invention, strictly speaking, is little more than a new combination of those images which have been previously gathered and deposited in the memory." William Jackson in his contemporary essays said of Reynolds ' there is much ingenuity and originality in all his academic discourses, replete with classical knowledge of his art, acute remarks on the works of others, and general taste and discernment'. Reynolds and the Royal Academy received a mixed reception. Critics included William Blake who published the vitriolic Annotations to Sir Joshua Reynolds' Discourses in 1808. J. M. W. Turner and James Northcote were fervent acolytes: Turner requested he be laid to rest at Reynolds' side, and Northcote, who spent four years as Reynolds' pupil, wrote to his family "I know him thoroughly, and all his faults, I am sure, and yet almost worship him." On 10 August 1784 Allan Ramsay died and the office of Principal Painter in Ordinary to King George III became vacant. Gainsborough felt that he had a good chance of securing it, but Reynolds felt he deserved it and threatened to resign the presidency of the Royal Academy if he did not receive it. Reynolds noted in his pocket book: "Sept. 1, 2½, to attend at the Lord Chancellor's Office to be sworn in painter to the King". It did not make Reynolds happy, however, as he wrote to Boswell: "If I had known what a shabby miserable place it is, I would not have asked for it; besides as things have turned out I think a certain person is not worth speaking to, nor speaking of", presumably meaning the king. Reynolds wrote to Jonathan Shipley, Bishop of St Asaph, a few weeks later: "Your Lordship congratulation on my succeeding Mr. Ramsay I take very kindly, but it is a most miserable office, it is reduced from two hundred to thirty-eight pounds per annum, the Kings Rat catcher I believe is a better place, and I am to be paid only a fourth part of what I have from other people, so that the Portraits of their Majesties are not likely to be better done now, than they used to be, I should be ruined if I was to paint them myself". to the splendor of the foliage, to the neglect of the stirring the earth about the roots. They cultivated only those arts which could add splendor to the nation, to the neglect of those which supported it – They neglected Trade & substantial Manufacture...but does it follow that a total revolution is necessary that because we have given ourselves up too much to the ornaments of life, we will now have none at all. I had long languished to see that kindly zealous friend, but his ill health had intimidated me from making the attempt": "He had a bandage over one eye, and the other shaded with a green half-bonnet. He seemed serious even to sadness, though extremely kind. 'I am very glad,' he said, in a meek voice and dejected accent, 'to see you again, and I wish I could see you better! but I have only one eye now, and hardly that.' I was really quite touched. Burke was present on the night Reynolds died, and was moved within hours to write a eulogy of Reynolds starting with the following sentiments: "Sir Joshua Reynolds was on very many accounts one of the most memorable men of his Time. He was the first Englishman who added the praise of the elegant Arts to the other Glories of his Country. In Taste, in grace, in facility, in happy invention, and in the richness and Harmony of colouring, he was equal to the great masters of the renowned Ages." Burke's tribute was well received and one journalist called it "the eulogium of Apelles pronounced by Pericles". In appearance Reynolds was not striking. Slight, he was about 5'6" with dark brown curls, a florid complexion and features that James Boswell thought were "rather too largely and strongly limned." He had a broad face and a cleft chin, and the bridge of his nose was slightly dented; his skin was scarred by smallpox and his upper lip disfigured as a result of falling from a horse as a young man. Edmond Malone asserted that "his appearance at first sight impressed the spectator with the idea of a well-born and well-bred English gentleman." In his mature years he suffered from deafness, as recorded by Fanny Burney, although this did not impede his lively social life (he used an ear trumpet). Some, such as Hester Lynch Piozzi, construed Reynolds' equable calm as cool and unfeeling. It is to this lukewarm temperament that Frederick W. Hilles, Bodman Professor of English Literature at Yale attributes Reynolds' never having married. In the editorial notes of his compendium Portraits by Sir Joshua Reynolds, Hilles theorizes that "as a corollary one might say that he [Reynolds] was somewhat lacking in a capacity for love", and cites Boswell's notary papers: "He said the reason he would never marry was that every woman whom he liked had grown indifferent to him, and he had been glad he did not marry her." Reynolds' own sister, Frances, who lived with him as housekeeper, took her own negative opinion further still, thinking him "a gloomy tyrant". The presence of family compensated Reynolds for the absence of a wife; he wrote on one occasion to his friend Bennet Langton, that both his sister and niece were away from home "so that I am quite a bachelor". Biographer Ian McIntyre discusses the possibility of Reynolds having enjoyed sexual rendezvous with certain clients, such as Nelly O'Brien (or "My Lady O'Brien", as he playfully dubbed her) and Kitty Fisher, who visited his house for more sittings than were strictly necessary. Dan Cruickshank in his book London's Sinful Secret summarized Reynolds as having visited and re-visited various reputed red light districts in London after his return from Italy as a possible contributor to his medical condition and appearance due to commonly contracted disease in those areas of London. ^ Russell, John. "ART VIEW; ANYBODY WHO WAS SOMEBODY KNOCKED AT HIS DOOR". ^ a b c Penny, Nicholas (1986). "The Ambitious Man". Reynolds (Exhibition catalogue). Royal Academy of Arts. p. 22. ^ Penny, Nicholas (1986). "The Ambitious Man". Reynolds (Exhibition catalogue). Royal Academy of Arts. pp. 17–8. ^ "Suzanna Beckford 1756". Tate Gallery. Retrieved 3 July 2016. ^ "Local History RichmondHill" (PDF). London Borough of Richmond. Archived from the original (PDF) on 4 February 2012. ^ Wendorf, Richard, Sir Joshua Reynolds: The Painter in Society (Cambridge, Mass. : Harvard University Press, 1998), p 46. ^ "RA250 UK". Retrieved 30 November 2018. ^ Carey, Juliet (30 March 2018). "Joshua Reynolds digital trail, Waddesdon Manor". Retrieved 30 November 2018. ^ "Burlington House courtyard – Joshua Reynolds". London Remembers. Retrieved 25 September 2014. ^ "About Us". Burlington House. Retrieved 25 September 2014. ^ Penston, Margaret (1 April 2003). "Stars in stone: the Annenberg Courtyard fountains". Astronomy and Geophysics. 44 (2): 2.20–2.21. doi:10.1046/j.1468-4004.2003.44220.x. ^ Dan Cruickshank, London's Sinful Secret, p.92. St. Martin's Press, New York (2009). Charles Robert Leslie and Tom Taylor, Life and Times of Sir Joshua Reynolds (London: John Murray, 1865, 2 volumes). Martin Postle, ‘Reynolds, Sir Joshua (1723–1792)’, Oxford Dictionary of National Biography, Oxford University Press, 2004; online edn, October 2009. Retrieved 24 September 2010. S. Smiles (ed. ), Sir Joshua Reynolds: The Acquisition of Genius (2009). Wikimedia Commons has media related to Joshua Reynolds. "Reynolds, Joshua" . Dictionary of National Biography. London: Smith, Elder & Co. 1885–1900.